Protect your patient and your testing instruments with the Pulmonary Function Filter. provides a high degree of protection for the patient as well as your testing equipment, while its low resistance allows for accurate testing results.Independent laboratory tests have verified that this pulmonary function filter is highly effective. consistently filters out 99.9% of bacteria and 99.9% of viruses. According to ATS recommendations for flow resistance in pulmonary function instrumentation, which suggest Resistance should be below 1.5 cm H2O/L/sec at Flow rates less than 12 L/sec1. The easily surpasses that recommendation, having a measured resistance of less than 0.78 cm H2O/L/sec at Flow rates of 12 L/sec. 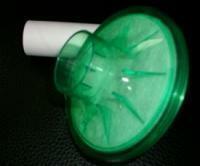 Description: Disposable Bacterial/Viral Filter, and if included disposable mouthpiece. INTENDED USE: The “SAYKIA” Filter is a disposable bacterial/viral filter designed to prevent biological contaminants from entering pulmonary function testing equipment. Inspect for damage, and dispose immediately if damaged. Connect securely to pulmonary equipment. If included, connect mouthpiece to small opening on filter. After use, dispose of properly.